Ask any driver who finishes second, and they’ll tell you how the first-place car was just a bit faster than theirs. But what would happen if all the cars were truly equal? Would true driver skill shine above all? We’ll find out the answer to the question Tuesday night when some of NASCAR’s brightest emerging talents — along with a few special guests — compete in the eNASCAR Gander Outdoors 100 iRacing Pro Invitational (3/19, 9 p.m. ET, eNASCAR.com) at iRacing’s virtual laser-scanned Martinsville Speedway. Sure, there may be no grandfather clock on the line, and you’ll have to cook up your own hot dogs, but who doesn’t like a little bit of short track action in Gander Outdoors trucks at ‘The Paperclip’ — especially when you’re watching rising NASCAR stars compete in identical trucks, the most level playing field a computer could create? So, of the 19 pro racers (well, 18 pro racers and a football player), who’s the favorite to bring home the glory? We’ll let some competitors’ tweets do the talking. 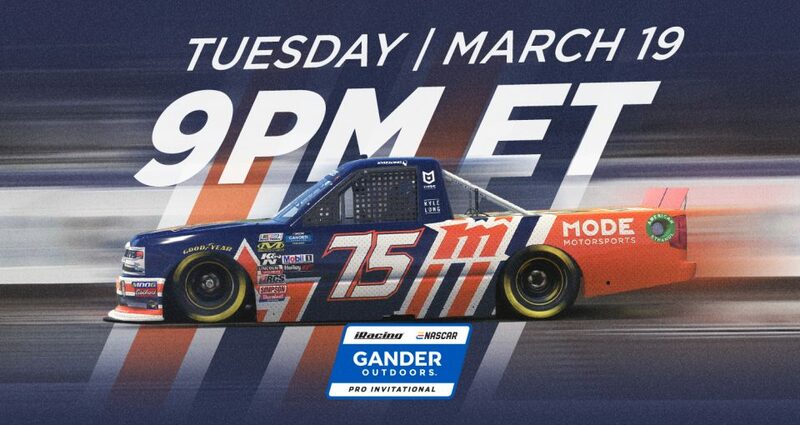 The eNASCAR Gander Outdoors 100 iRacing Pro Invitational takes place on Tuesday, March 19, 2019, at 9 p.m. ET, streaming via live broadcast on eNASCAR.com. Open qualifying takes place at 9:05 p.m., and the green flag drops at 9:20 p.m. for 100 laps of action around Martinsville Speedway. Plus, at the site of some of NASCAR’s famous most bump-and-run moves, expect some (virtual) fireworks.